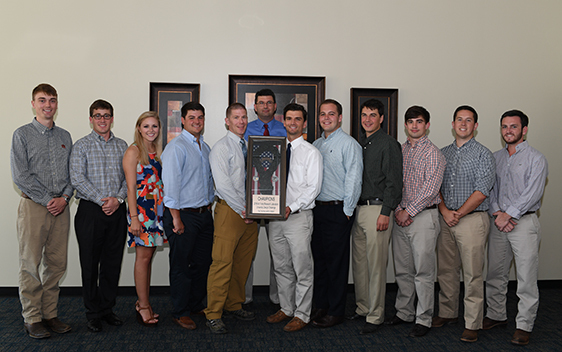 A senior student design team in Auburn’s Department of Mechanical Engineering has won the 2016 Air Force Research Laboratory University Challenge. The team developed a device to make it easier for special tactics battlefield airmen to deploy from a helicopter, in locations where the helicopter cannot touch down, using a technique known as fast-roping. The AFRL narrowed the field to nine finalists from 17 universities to solve this year’s difficult problem. The mission was to design and develop a descending system that allows military personnel with heavy equipment loads to safely, rapidly and effectively exit a helicopter via a thick, braided rope. Auburn’s work yielded a Tactical Rope Insertion Assist Device, or TRIAD, and tactical gloves. The TRIAD, according to the student team’s product description, is a passive assist device utilizing a roller-damper system that eliminates rope burn, controls descent and increases safety. It was tested up to 450 pounds and successfully lowered weight with a controlled descent speed as low as 6 feet per second. The TRIAD also was designed to utilize interchangeable rotary dampers to allow for multiple descent speeds or users of different weights. An appealing feature of the device, according to Devon Parker, past host and manager of the national AFRL Design Challenge competition, is it will require minimal, if any, additional design work. In addition to the TRIAD, a tactical glove was designed specifically for fast roping. The glove is ergonomically friendly, can be used while operating a weapon, and reduces the heat transferred to the hand during the fast roping operation. Senior design team undergraduate students included co-team leaders Caleb Clemons and Morgan Pelt, Logan Brost, Brent Gilbert, Ric Gilliland, Josh Grant, Meredith Jones, Jake MacKay, Zach Martin and Dalton Roe. Graduate student Austin Gurley helped steer the design effort; graduate student Wesley Hunko assisted in manufacturing the device; and Lewis Payton, associate research professor in mechanical engineering and director of the Design and Manufacturing Lab, and Roy Broughton, professor emeritus in polymer and fiber engineering, provided guidance throughout the project.